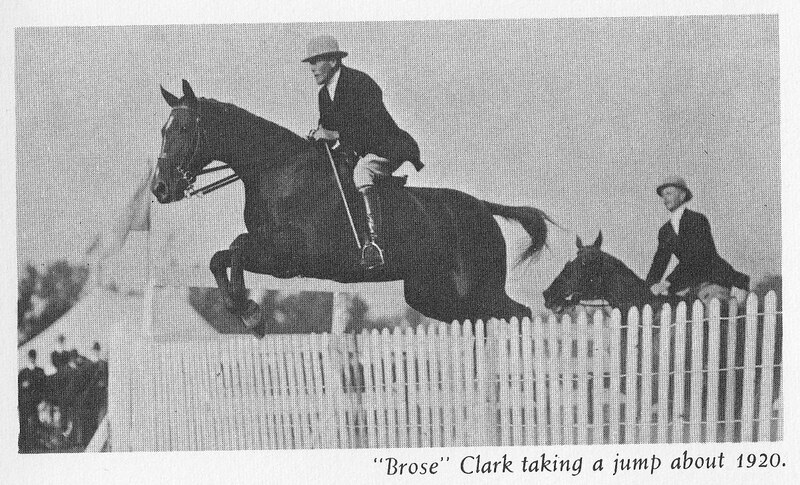 Ambrose Clark, owner of 'Broad Hollow House' in Old Westbury, seen taking a jump about 1920 from Church of the Advent: The First Fifty Years by Frederic Underwood, Ph.D. Click HERE for more on 'Broad Hollow House'. That's a great shot - even in 2011 its not as simple with digital cameras to get a well done jumper capture - with its timing. Brose' mother, Elizabeth Scriven, had after the passing of her first husband - Alfred Corning Clark - remarried Bishop Henry Codman Potter. She died just 8 months into the marriage. Potter, would become the 7th Bishop of the Episcopal Diocese of New York. As noted previously the horse-wild Bostwick family on the North Shore (and elsewhere) were heavily influenced by their uncle, Ambrose Clark. Perhaps you can opine on whether this picture is correctly captioned. Was Brose the jockey on the left, or was he the other fellow?